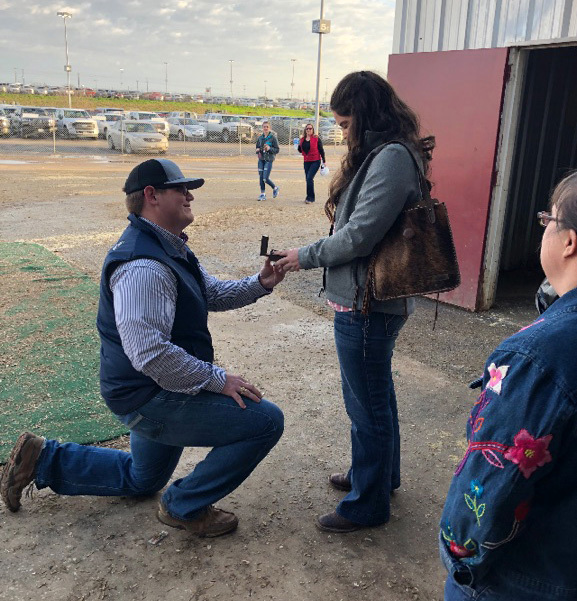 A Blinn College District alumnus recently proposed to his fiancé in the exact place where they first met – the San Antonio Stock Show and Rodeo. Now a Texas A&M University agricultural economics graduate student, Will Hussey met Texas A&M veterinary student Kate Jimerson at the San Antonio Stock Show and Rodeo four years ago while Hussey was a student at Blinn College. Hussey was an agriculture sciences student and member of the livestock judging team at Blinn, while Jimerson was a Texas A&M agriculture student. Hussey got down on one knee in the same show arena where he first laid eyes on Kate. Prior to College, Hussey and Jimerson both were San Antonio Stock Show and Rodeo scholars. Hussey earned a scholarship for livestock judging, while Jimerson earned one for showing livestock. Hussey was a member of Blinn’s livestock judging team from 2014-2016 before transferring to Texas A&M. He earned a bachelor’s degree in agricultural economics and animal science in 2018, while Jimerson earned a bachelor’s degree in animal science in 2017. The Agricultural Sciences Program is one of the fastest-growing and largest divisions in the Blinn College District. Blinn offers agriculture classes on all of its campuses, with the hub of the program located at the W.J. "Bill" Rankin Agricultural Complex on the Brenham Campus. Agricultural Sciences is an academically driven program providing accredited courses that lead to an associate degree and transfer to major universities. Blinn is an active member of the Agriculture Consortium of Texas and maintains close associations with department heads and representatives from all Texas agriculture universities to ensure a smooth transition for its students. The Agriculture Sciences Program also has one of the most active extracurricular programs in the state, including livestock judging, the Agriculture Club, wildlife, agriculture mechanics, horticulture, and agriculture sciences. For more information, visit www.blinn.edu/agricultural-sciences.